Pictured in the photo with Chief Gross is Ron Thomas (left) and Darrell Fry (right). 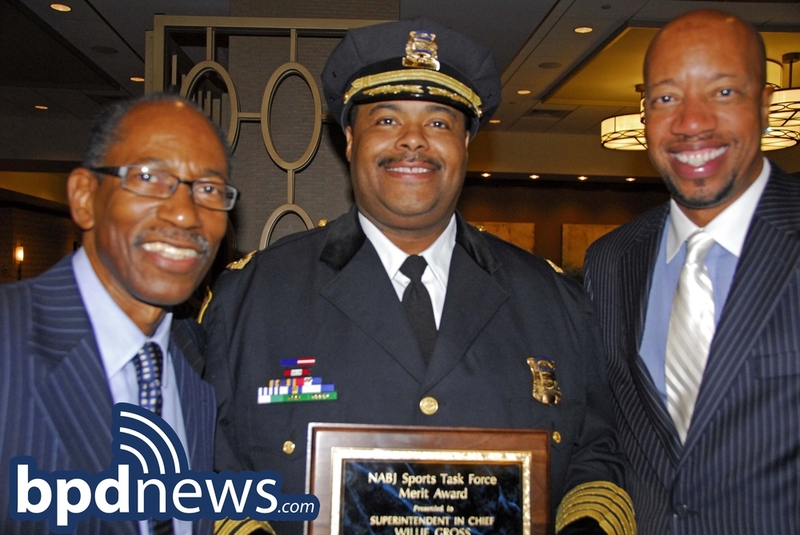 On Friday, August 1, 2014, the National Association of Black Journalists presented Boston Police Superintendent-in-Chief Willie Gross with the NABJ’s Sports Task Force Merit Award for his ability to use sports and its inherent lessons of teamwork as a means of communicating and connecting with Boston’s young people. In addition to Chief Gross, the NABJ recognized several individuals for their outstanding achievements and contributions to communities of color at its annual convention - including former Boston Red Sox player Jim Rice, former Boston Celtic Satch Sanders, former WNBA star Michelle Edwards, legendary basketball college basketball coach Alfreda Harris and sports personality Willie ‘Coach’ Maye.